Wright-Patterson Air Force Base, Ohio, U.S. The United States Armed Forces procurement of military aircraft began when the United States Army's Aeronautical Division of the Signal Corps (United States Army), acquired several examples of the Wright Military Flyer of 1909. USAAF/USAF aircraft Research and Development (R&D) was merged with aircraft procurement twice in the 20th Century (e.g., 1944, 1992). Air Materiel Command was established on March 9, 1946, and in November 1946, AMC's History Office published Materiel Research and Development in the Army Air Arm, 1914-1945. In 1947, AMC bases were transferred to the newly established United States Air Force, with facilities such as the storage depot in Maywood, California, being renamed Cheli Air Force Station. 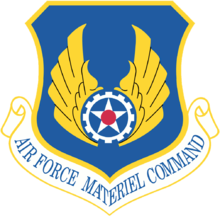 Air Force Materiel Command (AFMC) was activated on July 1, 1992, as part of a post-Cold War, USAF-wide reorganization that resulted in the merger of AFLC and AFSC into a single major command. After AFMC was established, the command's infrastructure saw significant reductions through Base Realignment and Closure (BRAC) actions. This included the BRAC-directed closure/privatization of the San Antonio Air Logistics Center at Kelly Air Force Base, Texas and the closure of Kelly Air Force Base as an independent installation, with incorporation of its runways and remaining military flight line areas as the Kelly Field Annex to adjacent Lackland Air Force Base. The Sacramento Air Logistics Center at McClellan Air Force Base was also closed/privatized and McClellan Air Force Base totally closed. McClellan became a totally civilian airport with the exception of Coast Guard Air Station Sacramento and the Air Force Recruiting Service's 364th Recruiting Squadron. Air Force Materiel Command conducts research, development, test and evaluation, and provides acquisition management services and logistics support. In 2012, there was a major reorganization (5 Center Construct) and several new centers were organized. Among them, the Air Force Sustainment Center at Tinker Air Force Base now directs the Oklahoma City Air Logistics Complex at Tinker Air Force Base, the Ogden Air Logistics Complex at Hill Air Force Base, and the Warner Robins Air Logistics Complex at Robins Air Force Base. The mission of the Air Force Sustainment Center is to Sustain Weapon System Readiness to generate Air power for America. The center provides war-winning expeditionary capabilities to the war fighter through world-class depot maintenance, supply chain management and installation support. In 2015, the command officially activated its sixth center, the Air Force Installation and Mission Support Center, which provides centralized management of installation and mission support capabilities across the Air Force. The center is located at Joint Base San Antonio, Texas. ^ "Air Force Materiel Command (USAF)". ^ "Air Force Systems Command". Air Force Historical Research Agency. 10 January 2008. Retrieved 17 August 2013. ^ "Units". Air Force Materiel Command. Retrieved 5 March 2015. ^ Tripp, Robert S.; Lynch, Kristin F.; Romano, Daniel M.; Shelton, William; Ausink, John A.; Duran, Chelsea Kaihoi; DeFeo, Robert G.; George, David W.; Conley, Raymond E. (2012). "Air Force Materiel Command Reorganization Analysis" (PDF). Rand Corporation. Retrieved 26 April 2017.